Check out our full line of Retro 51 Harley-Davidson line featuring the Blackline, Full Throttle, Stroker, Vintage Rider, and Streetnotes series. Choose from three designs in The Blackline series: metallic Bronze Eagle, matte Black H-D Skull, and the Chrome H-D. 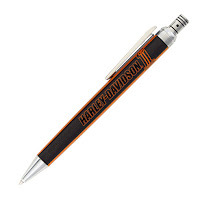 This pen open and closes with a magnetic cap and features an iconic Harley mid-ring. Comes loaded with an Easy Flow ballpoint refill and comes with a canvas pouch for storing. The Full Throttle series has all metal construction with unique styles that have been designed to evoke the Harley experience. 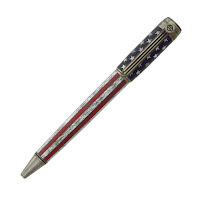 Twist to release the smooth flowing ballpoint ink. These pens have a nice weight to them for writing. Comes packaged in a sturdy gift box. Inspired by the punch of the pistons, the Harley Davidson Stroker click-top ball point pen features 6 different designs. The Vintage Rider is a mid-twist ballpoint pen and features 5 different designs, including the Pink Label Script with black on black printing plus glow in the dark accent printing. With every purchase of Harley-Davidson Pink Label merchandise, 3% of the suggested retail price is donated to organizations that support and empower women who are affected by breast cancer every day. Three new additions to the Harley Davidson Collection! 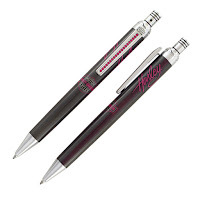 The Stroker "Pink Label Pinstripes" has a printed design with a clip featuring nineteen hot pink Swarovski gems. The Stroker "Dark One" has a bold black and orange print complete with the Dark Custom logo. And my favorite, the Vintage Rider "Easy" has a distressed American flag print.